It's just after 6am and I share a sun-bathed room with 100 men and women who could slam me face first into the tatami mat-covered floor without breaking a sweat. 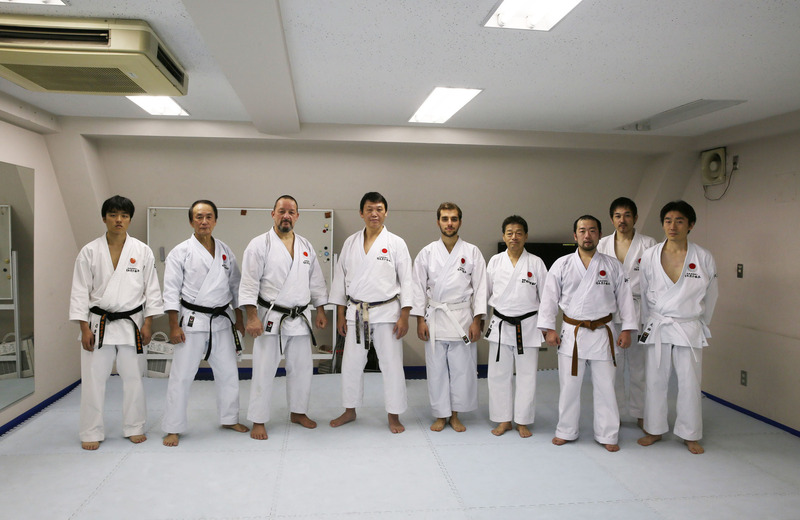 But luckily enough, that’s the last thing on their minds: this fearsome bunch, clad in loose white uniforms and black or dark blue hakama trousers, has assembled at the Aikido Honbu Dojo complex in Wakamatsucho for asageiko (morning practice). Their pursuit is aikido, a Japanese martial art founded by Morihei Ueshiba in the 1930s, loosely translated as ‘the way of the harmonious spirit’, and headquartered in this quiet Shinjuku neighbourhood. This morning’s group is even more international than usually, with enthusiasts from around the world having flown in for the annual All-Japan aikido demonstration that’s coming up in a few days. The founder’s great grandson, Mitsuteru Ueshiba, heads the session, performing the various waza (techniques) effortlessly with an opponent before calling for his disciples to repeat the move with their sparring partner, over and over and over. His students, some in their late teens, others well beyond retirement age, take turns throwing, twisting, pushing and falling over – all with admirable control and care for their partner’s safety. This process of ‘mental improvement and cultivation of inner strength’, says the 36-year-old Ueshiba, is at the core of aikido. While aikido’s lack of a competitive element may keep it out of the Olympics, it still makes for a spectacular spectator experience. Take the annual ‘enbukai’ demonstration, a grand event held at the Nippon Budokan, an arena considered the spiritual centre of Japanese martial arts. 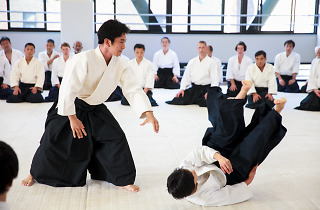 During this all-day jamboree, performances range from the cautious and detail-oriented movement of casual aikido-ka representing their school, company or local dojo, to the spectacularly sharp and dynamic throws and suppression techniques of top-level sensei, including Ueshiba and his father, doshu (grand master) Moriteru Ueshiba. 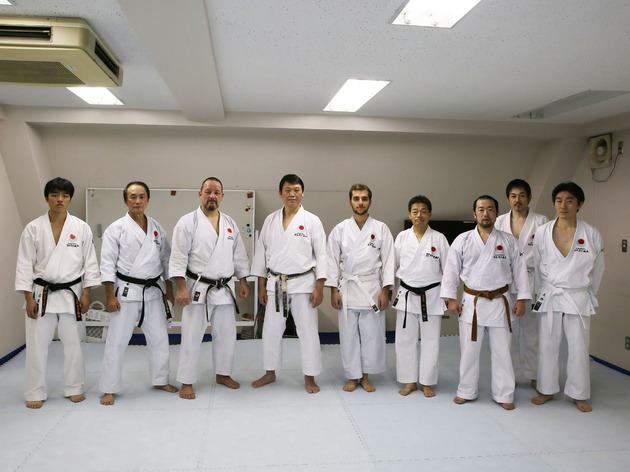 With the 14,000-seat Budokan all but packed for the demonstration every year and the number of practitioners steadily growing around the world, it’s hardly surprising that Mitsuteru Ueshiba is happy about the state of his great grandfather’s legacy. 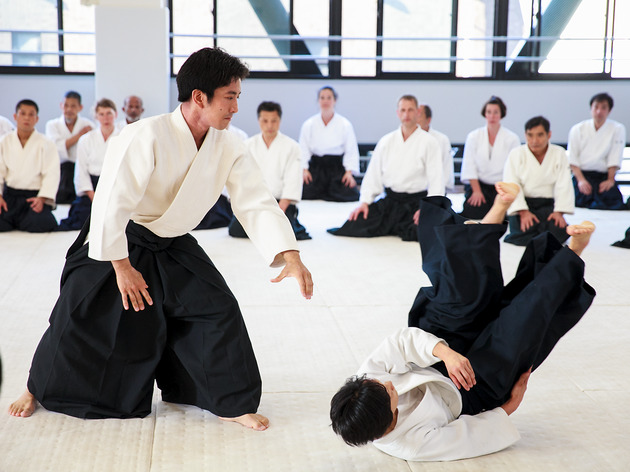 Want to try aikido for yourself? Mitsuteru Ueshiba recommends contacting your local dojo directly – you can search for a training centre here. The All-Japan Aikido Demonstration takes place in late May every year.